Bangalore: From providing food lovers an excuse to consume lots of cakes and wine, and to others a reason to exchange gifts and seeing family members and friends, Christmas has turned into an occasion of celebration for everyone. And a big business. 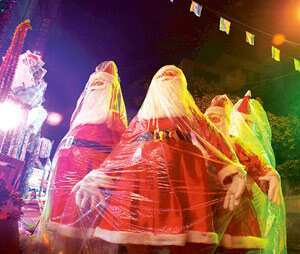 Bada din, or big day, which marks the birth of Jesus Christ, has assumed secular overtones in the country in the last few years. “I think the whole idea of celebrating Christmas is very attractive. I find it a very warm festival. For me it is...more about sharing affection, warmth with my dear ones," says 28-year-old New Delhi-based technical writer Manila Kulkarni, who is not a Christian. The festival is synonymous with cakes, cookies and puddings, carols, candles, mistletoe and decorating Christmas trees. Bakeries across India come up with innovative cake designs. Sales of cakes, cookies and pastries shoot up by 25-30% in December. Bangalore’s oldest bakery, Koshy’s, for instance, will make about eight tonnes of cake and 1.5 tonnes of plum pudding this Christmas. Still, a lot of the cooking is done at home with old recipes coming out of the larder. In India, regional dishes also often take over. “Our emphasis is more on sweet dishes. We make plum cakes, cookies, kalkal (a sweet that has a filling of grated coconut and sugar) and unniappam (a jaggery and rice flour preparation). Turkey is more common in the West. We make special biryani, chicken chops and mutton for the occasion, generally accompanied with home-made wine," says Bangalore-based Lily Thompson. “Gifts exchanged during this period are generally restricted to goodies and diaries and calendars. The spending on gifts is significantly lower during Christmas than Diwali, which goes above Rs2,000 crore," says one Mumbai-based analyst, who did not wish to be named. According to the Retailer’s Association of India, year-end sales can add up to as much as 30% to the country’s annual retail trade of $350 billion. Christmas shoppers at Khan Market in New Delhi. A shopkeeper sells dry fruits and sweets for Christmas at Bandra Hill Road in Mumbai. A Christmas shopper at New Market, Kolkata. What is Christmas without cakes, pastries and cookies. A little boy takes his pick. Christmas shoppers outside Borivili station in Mumbai. Simpark Market in Kolkata all decked up to welcome Christmas shoppers. Kavitha Srinivasa and Ajayan in Kochi contributed to this story.